You should always have your scaffolding installed by a professional, even if the job will only take a short while. As an amateur, how can you understand the importance of the correct couplings, or how to work out the best way to situate your scaffold? Particular attention should be paid to how the scaffolding is sited and a level hard base should always be used. Propping one leg up on a brick is completely irresponsible and could end in a lawsuit or serious injury. The scaffolding should be deemed safe by a professional before anybody ascends. All work areas should be clutter-free as nobody likes to trip over something and fall down. This is especially true when working on scaffolding as the fall could be a very long one. It is also essential that nothing could accidentally be pushed over the edge of the scaffolding; this could cause serious harm to somebody underneath. If there is nothing to trip over, or be kicked over the edge these things can’t happen, so keep the area neat and tidy. Whether you are working up the scaffolding or are working underneath it, you should be wearing a hard hat. The same is true for anywhere on the site, but it is more relevant for scaffolding where objects are so likely to fall from above. A helmet is one safety item that workers cannot claim interfere with their work and should be worn religiously. A safety harness is an inexpensive way to avoid a fall that could be fatal. 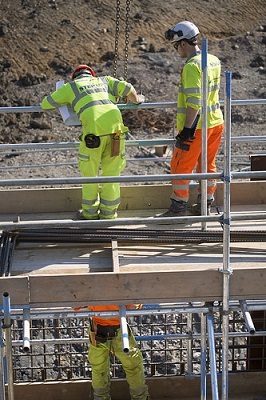 Workers who work on very high scaffolding systems often wear a harness, but those working lower down seem to feel them unnecessary. However, the truth is that falling from three meters can be as fatal as falling from ten. Wearing a harness is also a great way for those less experienced on a scaffold to feel safe before their confidence has built up. You can drop things on your feet as easily when working on scaffolding as anywhere else. However, scaffolding presents another problem for your footwear; you should be wearing safety boots or shoes that give you extra grip, and non-slip soles are a complete must. Wet conditions are much more serious for those who could be falling a long way. You are liable for your workmate’s safety as well as your own and you should be vigilant of any hazards that could affect you. If your workmates do the same you can all work in a hazard free environment. If the correct precautions are taken, you will be as safe working up in the as down on the ground; so make sure that they are taken.